SANTA MONICA, Calif., Nov. 14, 2018 /PRNewswire/ -- For a remarkable fifth straight year, Macerich (NYSE: MAC), one of the nation's leading owners, operators and developers of one-of-a-kind retail properties in top markets, today announced that the National Association of Real Estate Investment Trusts (Nareit) has named the company 2018 Retail "Leader in the Light." Adding to this exceptional honor, Macerich this fall also achieved two other important measures of sustainability leadership, both for the fourth year in a row: GRESB's #1 ranking in the North American Retail Sector for 2018, and a place on the Environmental Protection Agency's Green Power Partnership list of Top 30 On-Site Generation companies. As well, Macerich's major redevelopment of Broadway Plaza in Walnut Creek, CA, this fall earned prestigious LEED Gold® certification awarded by the U.S. Green Building Council. "I am very proud of Macerich's well-recognized and growing leadership in sustainability," said Art Coppola, Chief Executive Officer, Macerich. "In addition to our portfolio of high-performing trophy properties in many of the country's most attractive markets, we have staked out a leadership position as responsible stewards of the environment – an accomplishment earned over the past 10 years and one I see as a key and continuing aspect of my legacy at Macerich." New for 2019 is an expanded, portfolio-wide commitment to on-property recycling of aluminum, plastic and glass that will further support Macerich's long-term goal of achieving carbon neutrality by 2030. "I like to say that sustainability is a natural for Macerich. Not only is it good for the planet and for our bottom line, it's also the right fit for shoppers in our markets," added Coppola. "Macerich properties are located in some of the most environmentally aware consumer markets in the world – from Santa Monica and Portland to Boulder, Northern Virginia and New York City. Our sustainable retail environments provide a powerful differentiator for Macerich that matters for our customers, retailers and investors." For more information on Macerich's comprehensive sustainability efforts and impacts, please view the 2018 Macerich Sustainability Report at www.macerich.com. Macerich currently owns 52 million square feet of real estate consisting primarily of interests in 48 regional shopping centers. Macerich specializes in successful retail properties in many of the country's most attractive, densely populated markets with significant presence in the Pacific Rim, Arizona, Chicago and the Metro New York to Washington, DC corridor. 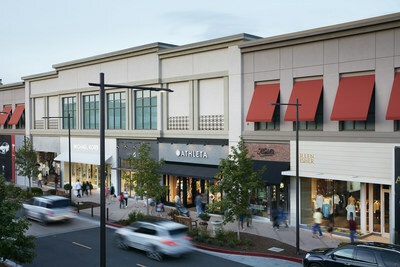 Additional information about Macerich can be obtained from the Company's website at www.macerich.com.